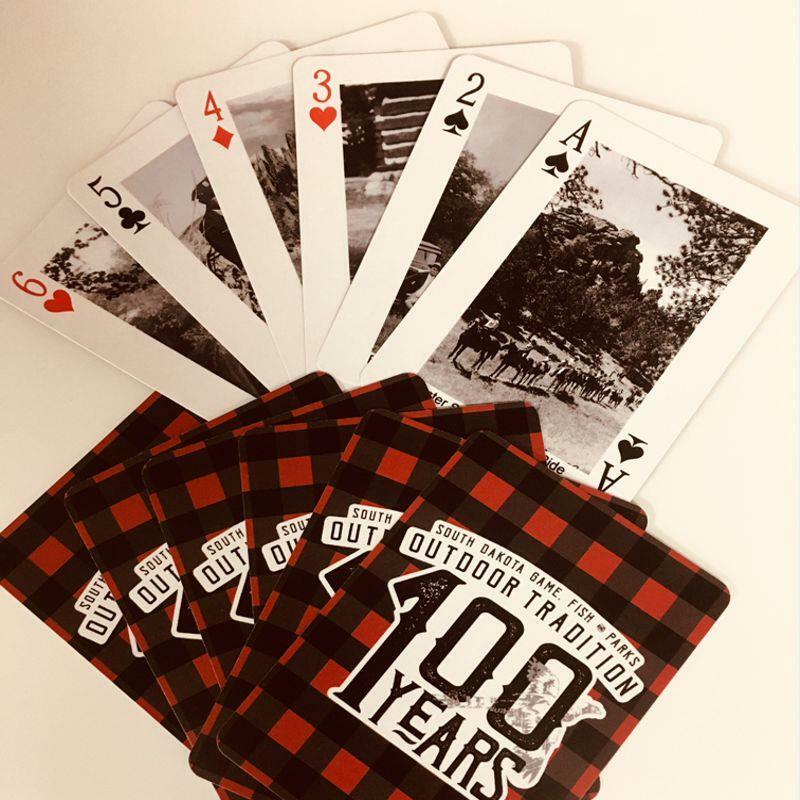 These playing cards will take you back with a buffalo-plaid back with the “100 Years of Outdoor Tradition” logo. Faces feature a different historic photo for each number. 54-card deck, standard size. This bag combines retro camping looks with modern needs. Zippered main compartment with flap closure features a padded computer pocket that holds most 15" laptops. Open front pocket is sized to fit most tablets and eReaders. Adjustable carry strap allows for cross-body wear. Red buffalo check plaid. 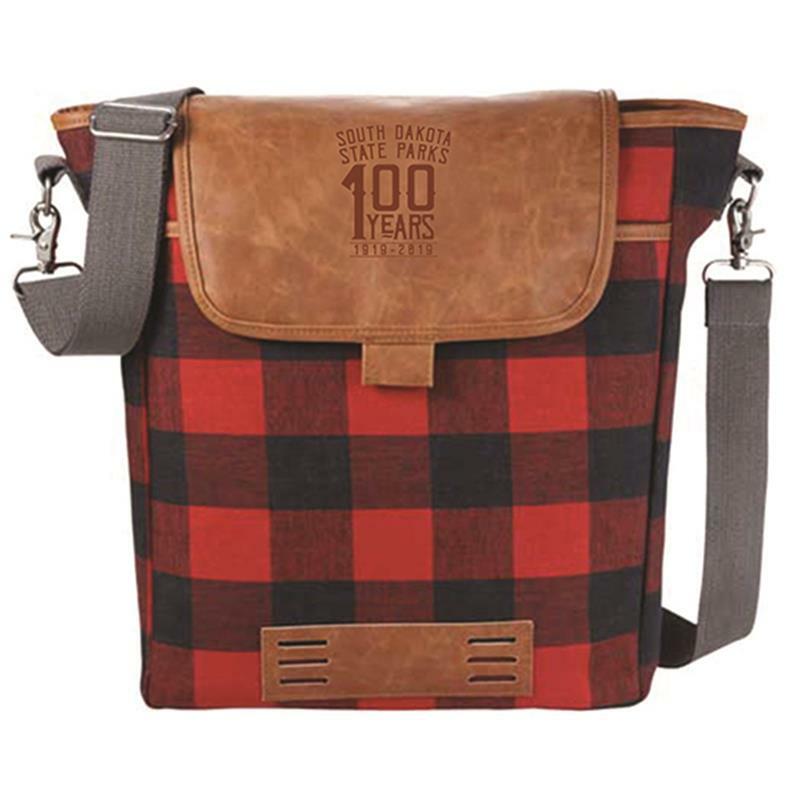 Debossed with the “100 Years of State Parks” logo on flap closure. 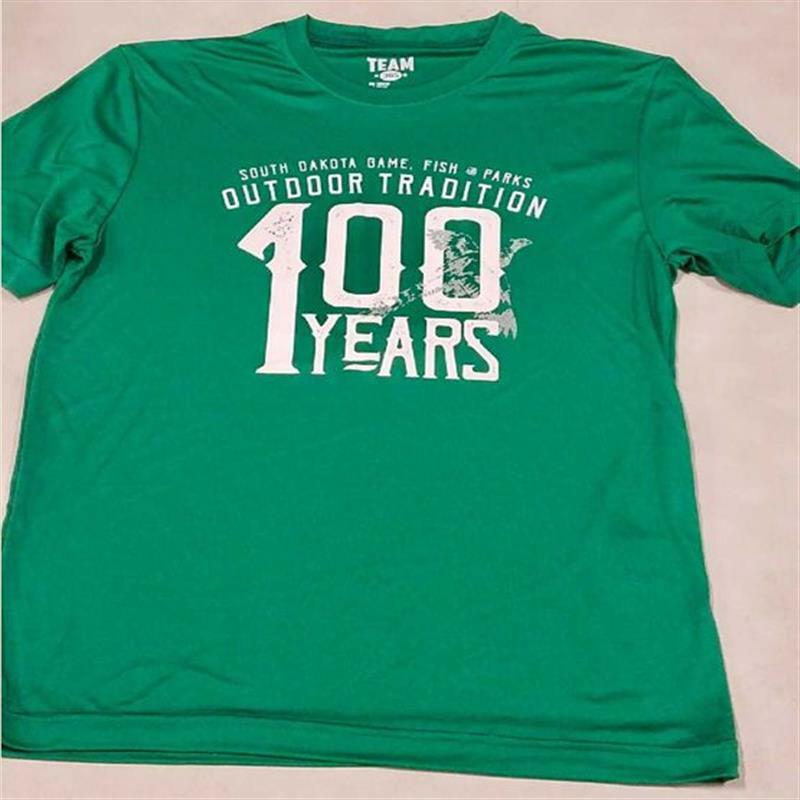 Size: 14"l x 4.5"w x 14.25"h.
YOUTH LG Zone Performance T-shirt (Kelly Green) Crewneck performance tee is made of 3.8-oz, 100% polyester interlock material. Moisture-wicking properties wick sweat away to keep the kiddos cool, dry and fresh. UPF 40+ UV protection performance helps prevent sunburn and is perfect for outdoor use when out on the boat, at the beach or near the campsite. These short tees are designed with an athletic fit and feature a heat sealed label. YOUTH MED Zone Performance T-shirt (Kelly Green) Crewneck performance tee is made of 3.8-oz, 100% polyester interlock material. Moisture-wicking properties wick sweat away to keep the kiddos cool, dry and fresh. UPF 40+ UV protection performance helps prevent sunburn and is perfect for outdoor use when out on the boat, at the beach or near the campsite. These short tees are designed with an athletic fit and feature a heat sealed label. YOUTH SM Zone Performance T-shirt (Kelly Green) Crewneck performance tee is made of 3.8-oz, 100% polyester interlock material. Moisture-wicking properties wick sweat away to keep the kiddos cool, dry and fresh. UPF 40+ UV protection performance helps prevent sunburn and is perfect for outdoor use when out on the boat, at the beach or near the campsite. These short tees are designed with an athletic fit and feature a heat sealed label. YOUTH XL Zone Performance T-shirt (Kelly Green) Crewneck performance tee is made of 3.8-oz, 100% polyester interlock material. Moisture-wicking properties wick sweat away to keep the kiddos cool, dry and fresh. UPF 40+ UV protection performance helps prevent sunburn and is perfect for outdoor use when out on the boat, at the beach or near the campsite. These short tees are designed with an athletic fit and feature a heat sealed label. The XL size could serve as a SMALL adult size for women. Celebrate 100 years of South Dakota State Parks with this ode to campers past. 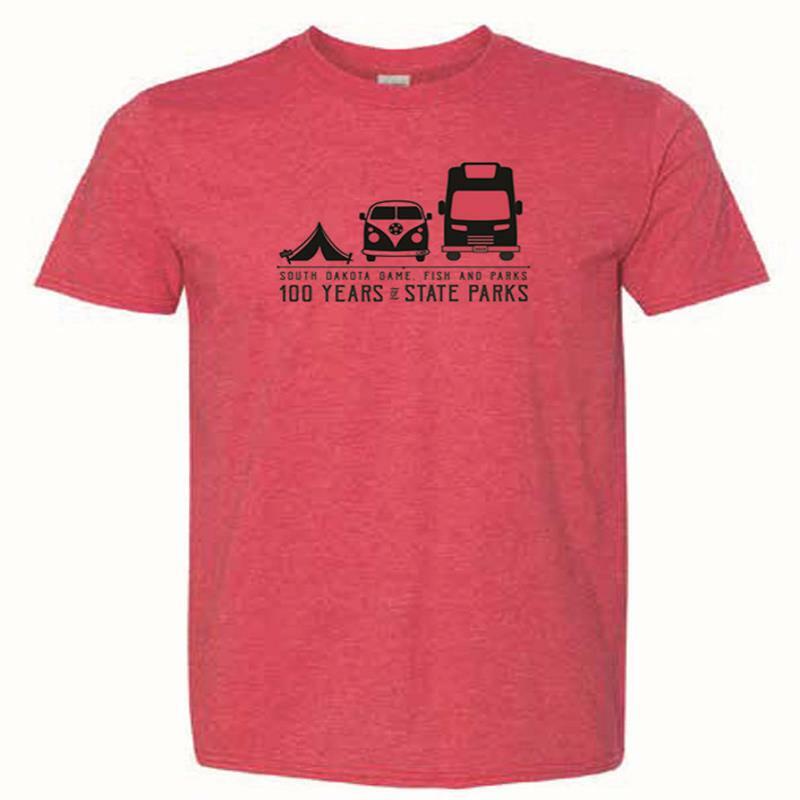 Graphics take us through the eras of tents, bus campers and motorhomes, accompanied by the “100 Years of State Parks” logo. Softstyle short sleeve t-shirt. Heather red with black imprint. Unisex fit. 65% polyester/35% cotton.